"Politaire is a Solitaire mixed with Poker. 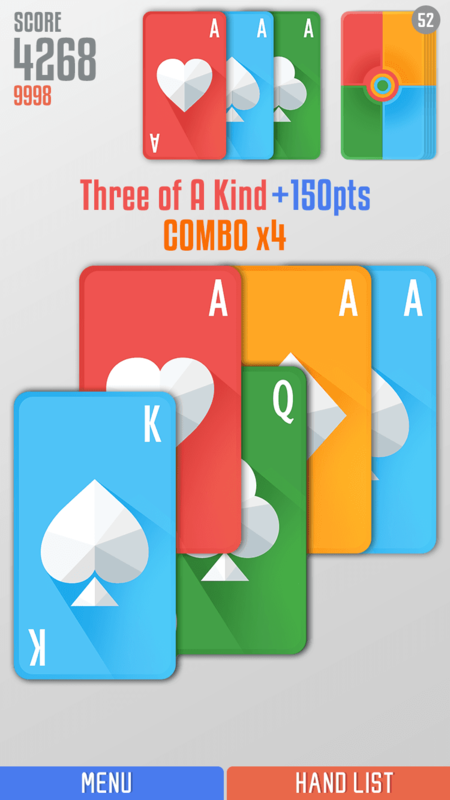 Your aim is to make winning hands with 5 active cards in your hand. The minimalist visuals hide an interesting depth that will keep challenging and surprising as you master it." 2. My high score is 2800 after 5 games. 3. You could better maximize your score by keeping a companion deck of cards to keep track of what's left toward the end. Expert bridge players keep this in their memory banks constantly. 4. You may be going for a yellow flush....but if there's a blue 7 to match your yellow 7 - tough luck. That's why this game is interesting. Outfolded by 3 Sprockets Free! Crazy Container by Luiz Lima Free! Color Kakuro by Chi Wun Li Free!